Most social networks have a mechanism that makes it easy to export all your status updates and photos, but figuring out how to do it isn't always simple. Plus you have to go through each social network one at a time. 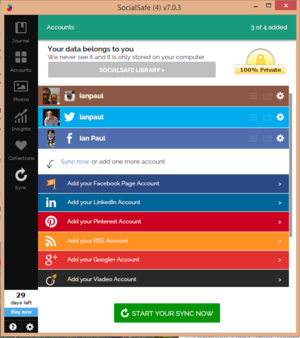 If you're looking for an easier way to get most of your data out of the social networks check out SocialSafe. This desktop program is designed to back up your social data on your own PC and even lets you lock down your data with a password. SocialSafe helps you download your social data for free. 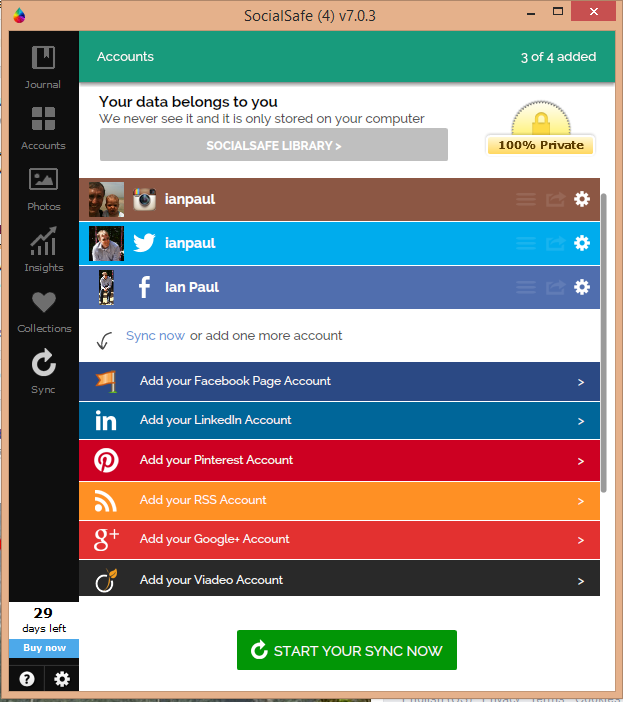 SocialSafe lets you grab your data from up to four social networking accounts for free. If you need to back up more social accounts than that, you can pay $7 per year, but most people should be fine with the free version. Adding accounts to SocialSafe is pretty easy. When the program fires up for the first time it gives you the option to add accounts from Facebook, Google+, Instagram, LinkedIn, Pinterest, and Twitter. Click on the social networks you want to add and you'll be prompted to sign in to each one using each service's website. This means you don't have to hand your login data over to SocialSafe, and logging in with two-factor authentication isn't a problem. Once you've logged in to your accounts, SocialSafe will start downloading your data. How long it takes to complete will depend on how much stuff you've shared online. Once the initial download is done, SocialSafe will regularly check your accounts for new items to back up to your PC. You can view all your data through SocialSafe, or you can export your data to a folder on your PC. Exported SocialSafe data is very raw, unlike the more nicely packaged HTML formats you get when you download backups directly from Facebook or Twitter. Nevertheless, it's good to know there's an export option and that SocialSafe isn't locking up any data it downloads on your behalf.